“People on the inside. Water on the outside. Boats are for water. Rocks are for scotch.” Capt. Barry’s Sailing 101 philosophy. It all came back to me in aromatherapy form as we unpacked our ditty bags: the smoke from the ever-burning wood fire that produced fragrant fresh-baked breads, muffins, and cookies; the balsam sachet bags on our pillows; the intoxicating liquor of just-caught, just-boiled Maine lobster; the salty crisp musk of the sea; and even, on the first couple of days, the fog – thick as chow-dah (as they say it in Maine) and delicious as mystery. The rocking motion of the 90-foot schooner Mary Day lingered for a day or so, and in my sleep and reverie I could still hear the lonely clang of a buoy bell penetrating the fog, the woohoos of the crew at the sounding of the meal bell, the curiously brogued and melancholic sea chanteys, and the sibilant woosh-flap of unfurled sails, like great egret wings. Our five-day adventure with Maine Windjammers, which this year celebrates 75 years, began with a Cape Air puddlejumper flight from Boston to Rockland, Maine, one bright late-September afternoon. Several of the Windjammers’ fleet of 12 anchor in Rockland’s harbor, but our Mary Day calls the nearby town of Camden port, so that’s where my husband, Rob, and I headed. After dropping our bags in our three-bunk cabin and getting a tour of the circa-1962 schooner, we headed into town to secure our liquor supply and the first lobster meal of the week at Bayview Lobster overlooking the harbor. In the dark of a starry night, we returned to the harmony of three friends who had brought their melodious voices and guitars along for the ride and eventually had everyone aboard singing as we pulled lines, whiled away afternoon hours, and sipped our evening libations. 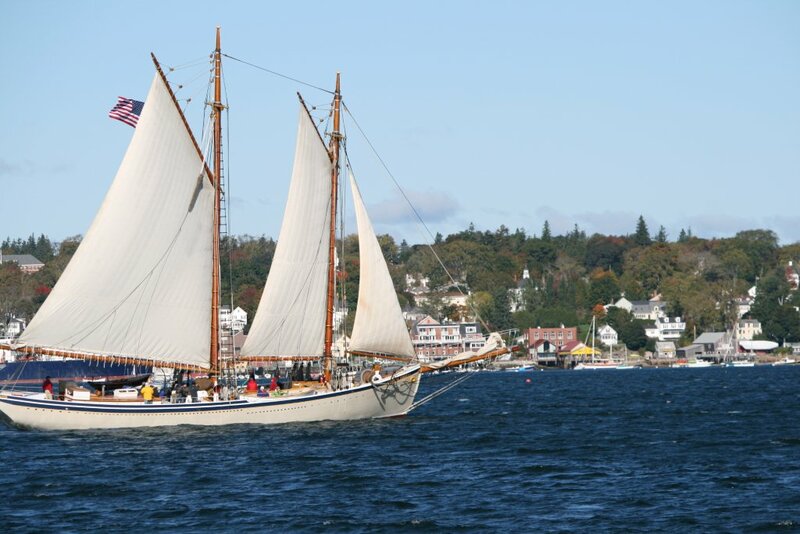 The Mary Day, named after her first owner, was one of the first Maine schooners outfitted specifically as a passenger boat. 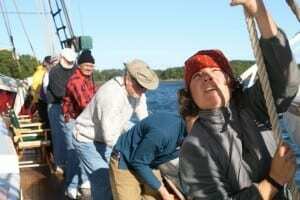 The others in the fleet lived previous lives hauling fish, granite, and lumber through the tangled Maine bay waters. When railroads replaced schooners in the 1930s, the vision of Capt. Frank Swift saved the graceful and lovely wooden sailing ships from abandonment with the notion of refurbishing them for overnight sailing cruises. Seven of the fleet’s vessels have since been designated National Historic Landmarks, including two of America’s oldest working coastal schooners built in 1871. We may have been biased, but out of all the schooners we came across in Penobscot Bay, we 14 passengers decided Mary Day was clearly the most stunning with her gilded scroll work on the bow and sleek profile. The beauty of the Mary Day, however, lies deeper than the character of the vessel. Its captains, Barry King and Jennifer Martin, clearly define their cruises ever as much as the vessel. Both often sail excursions with their two red-headed children, but since school was in, Capt. Barry sailed solo. Well not totally: There was Chief Mate Rob and many willing hands on board to drive the ship throughout the four days aboard. 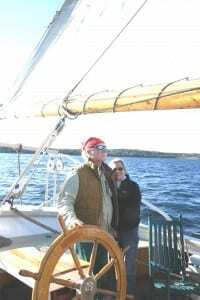 In those four days we pretty much experienced the realm of Maine’s sailing climate, starting out with tropic winds, fog, and bands of rain and wind gusts, then finishing the last two days with sharp autumn definition, north winds, and skies so blue the seawater was jealous. Capt. Barry’s most notable quality – aside from his storytelling and music-making abilities, sense of humor, calm and instructing manner, and motto “Be Well. Do Good” – was his instinct for hiring crew. Young Rob led us in sail hoisting and furling maneuvers with kindly spoken instructions, jokes, and praise. Deck hands Katie and Johann stood ever ready to answer questions or teach a knot no matter how full their hands were. Then there were Chief Cook Ina and Assistant Cook Lea, who pulled amazing things out of a tiny galley and wood-burning stove-oven like rabbits out of a hat. The first night aboard we had our all-you-can-eat lobster picnic aboard, because weather denied us a beach landing. Didn’t matter, the lobsters we had picked up that day from a fisherman at sea couldn’t have tasted any better than snapping them on board and flinging the shells out to sea. 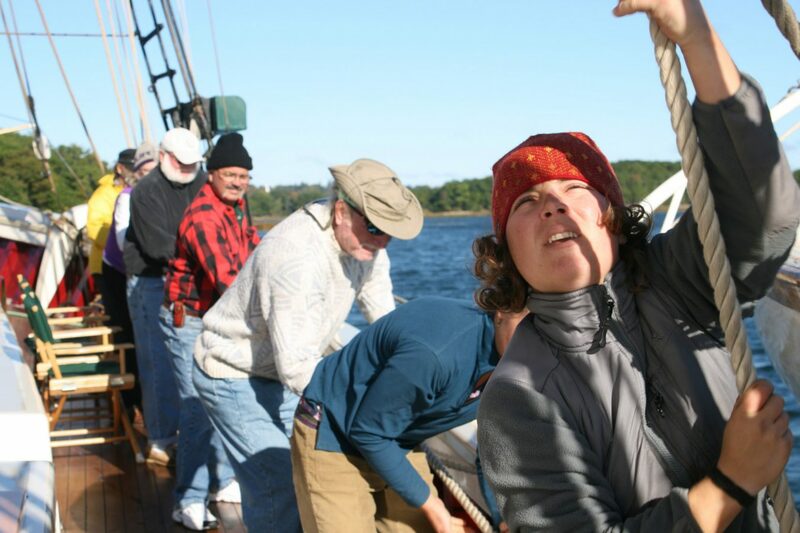 Weather permitting, the schooner stops every day to allow passengers to explore harbor towns, islands, and parks. There’s no itinerary aboard the Mary Day; it goes where the wind takes it. We were tendered one day to Holbrook Island Sanctuary, which we promptly renamed Mosquito Island. Being anchored in Smith Bay along with two other windjammers resulted in muffin wars after the crew of the Lewis R. French reportedly hijacked one of our peapods (a.k.a. paddled tender boats). Another day, too windy to put in at pretty little coastal Castine, we anchored instead in Pulpit Cove and toured around North Haven Island. In between shore excursions, dining gloriously, unfurling and furling sails, and getting together for games and singing after dinner, we reached a medium of relaxation normally unattainable in four days’ time. One of the greatest pleasures, as Capt. Barry pointed out, was post-lunch napping in our cozy cabin while under sail – rocked to sleep, despite the creaking, by the sea. Gathering in the salon for chatting, knitting, reading, or helping out the galley staff was a pleasant way to escape the wind and chill of the sea on those 50-degree days. After a day or two, simply staring out at sea with no distraction, intent, or purpose was just the thing, and the hours breezed by like the occasional harbor seal, dolphin, bald eagle, hawk, and scoter duck. Before it seemed possible, we were sailing into Camden Harbor and the mood turned already wistful and nostalgic as everyone exchanged addresses, and the Throat Singers (as I had dubbed the three friends – “throat” being a nautical term) composed their final opus – a happy sea chantey to the tune of Gilligan’s Island that incorporated each crew member and passenger. 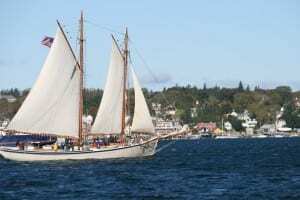 Maine Windjammer Association, 800-807-WIND, www.sailmainecoast.com. Two- to eight-night excursions run late May through early October, with special themed cruises throughout the season.